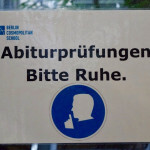 Today the written Abitur examinations start – also here in Berlin Cosmopolitan School. We wish our Abitur students all the best and we keep our fingers crossed. On Friday, March 29, students from 8th grade visited the House of One foundation for a workshop about religion and identity as part of their ethics unit on the world religions. The building House of One, when completed in 2020, will house a synagogue, a church and a mosque as well as a fourth common room for all. 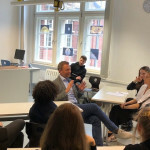 On Thursday, March 28, the Federal Chairman of the FDP, Christian Lindner, visited the Berlin Cosmopolitan School (BCS). 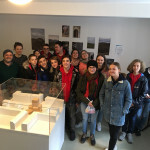 There he discussed environmental protection and the “Fridays for Future” movement with students from secondary and primary school. An RTL TV team filmed the discussion and then interviewed several participants. 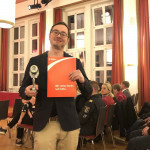 We are very proud to announce that BCS Maths and Physics Teacher, Mr. Douglas Weber has been given the “Angel of the City” (“Engel der Großstadt”) award. In the summer of 2018, he saved the life of a man who had collapsed on a train platform. Mr Weber, who at that time accompanied a grade 8 excursion, immediately began resuscitating the unconscious until the ambulance arrived.